There will never be an end to my rice story. Rice is the one I must have everyday regardless where I am and what I do. I bet maybe I can include you as well ah? Where are you Malaysians? Rice is your favorite right? Of course, so to speak on your behalf (Ghee Rice & Nasi Dagang). Vadai out of cooked rice? 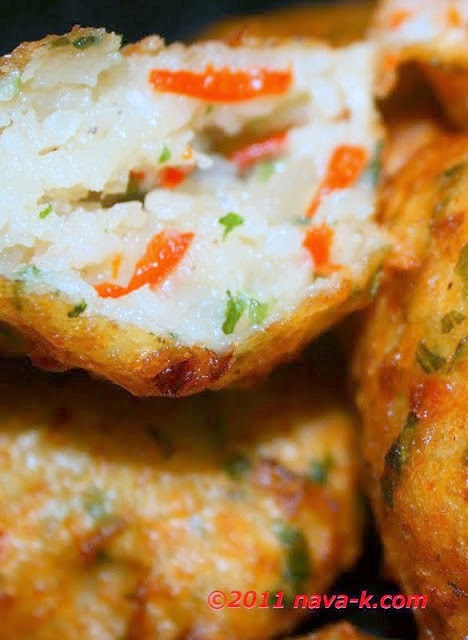 How to make these crispy on the outside and soft bite inside rice vadai? Please read on followers of "cook with nava-k". Take care. 1/2 cup all purpose flour. Add water (about 1 1/2 cups) into the rice. Stir and cook over low heat till mushy but with some grains still intact. Mix in all the other ingredients except oil. Combine and shape the sticky dough into round flat balls. If the dough is sticks to your hands, wet hands first before shaping. Deep fry until dark golden brown in color. Drain over kitchen towel and its ready to go into the mouth. For extra taste and flavor, dip into any type of sauce you like. Don't forget to trend alongside "cook with nava-k"on every other social media please!! Now THIS is the type of fritter I'm talking about. The ones I made were alright, but they didn't really pack the flavor I was looking for. Definitely like this recipe :) Buzzed! This remind me a little of Italian Aranchini, those wonderful little risotto ball. 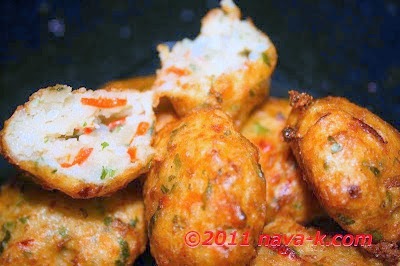 These are spicier so more to my liking..
hi nava, this is a great vadai recipe. it is one of my favorite fritters, especially the curry taste. most likely hers will be published friday next week, that means your cheese write up can be posted around wednesday aug 10th. so you still have time to do it and many thanks for your positive and kind response on this. take care. These sound delicious. We used to make fish or crab cakes and bulk them out with rice, it also made them hold together better. The Italians do it with left over risotto too. I like your spicy version better! Love all the lovely comments everyone, I am not sure whether you can find this version I made from rice although the other types are the common ones. Congratulations on making Food Buzz's Top 9! I am SO happy for you - this was a terrific recipe! Wow, this is definitely a new one to me. I love vadai and have made it with dhal only. I must share this recipe with my mother. Thanks for sharing with us. : ) Congrats on making Foodbuzz Top 9! delicious..... thank you for the share! i love these deep fried rice patties. yours sounds so flavorful. perfect with a light salad. thanks so much for the continuous support all my great friends. Wow! This is such a great idea! Now I know what to do with leftover rice. Love the look of these, great idea.